Patricia Anne Kirkham was born in Edgbaston, Birmingham in 1932, later moving to Hockley, another Birmingham suburb, where there was an ice rink (later to become the Mecca Olympic roller rink in the 1960's). Kirkham always wanted to ice skate in her early years but could not find anybody within her circle of friends who wanted to go with her. Eventually she asked her father if he would take her. 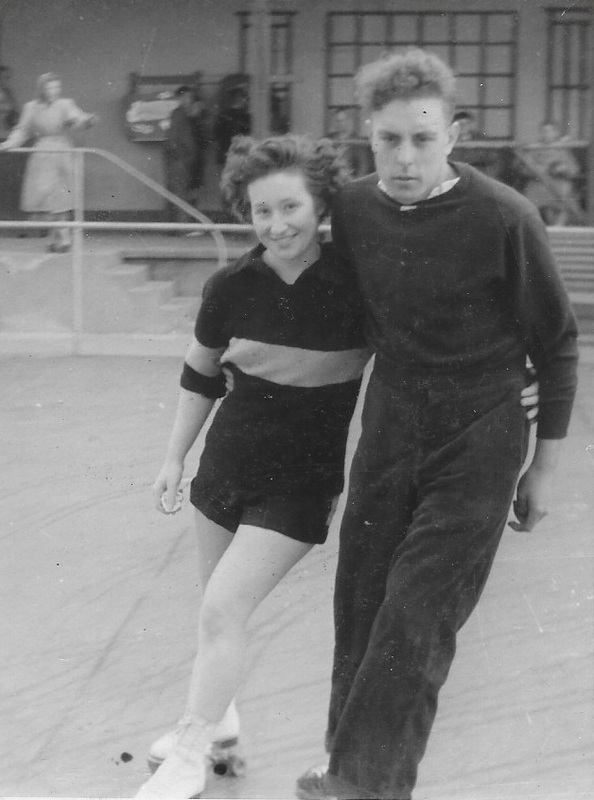 He told her that he couldn't ice skate but he could roller skate and arranged for them both to go to the Tower Ballroom in nearby Reservoir Road who held general sessions on the old asbestos floor. 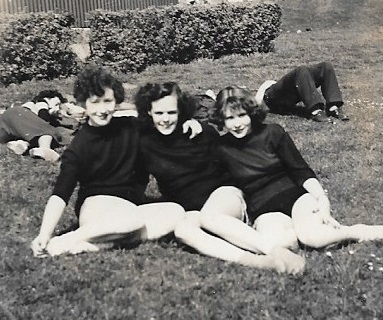 Kirkham had continued to live in Birmingham under the rain of bombs that frequently fell during the Second World War, but it was now the mid 1940's and with the war over recreational activities were very much to the fore in people's lives. Kirkham herself had always enjoyed sport and physical exercise and skating was just the ticket. It soon transpired, however, that her father couldn't actually roller skate either and so he asked a local dance skater if he could help his daughter learn how to master the rink. During this time Kirkham met a young Barrie Brown, later to be her fiance and eventual husband. Both used to frequent the local rink and the young Kirkham soon found she preferred the "fast stuff" as she called it, compared to the dance skating. As they got better at skating the couple used to also go over to Wolverhampton and strap their skates on at the local rink over in the Black Country. It was around this time that the old Birmingham Embassy Sportsdrome in Walford Road re-opened as a roller rink having previously been used for storage during the war years. Former speed skater, Charlie Bush, started up the old Birmingham speed club, calling themselves the Birmingham Eagles. Kirkham went along and quickly joined the club aged just 16. Within the first 12 months Kirkham was in her first race, held at the Alexandra Palace rink in London. She was very nervous but remembers that all the people seemed very friendly. Not many women competed back then and it was seen as somewhat strange for a woman to speed skate. Despite this, Kirkham continued to race on a fairly frequent basis, the sport starting to once more become popular shortly after the war. Her racing took her to Herne Bay, Bradford, Manchester, Rochester and the old Broadway rink in Cricklewood, avoiding the notable hole in the rink floor. Back in the early 1950's the Birmingham women used to train separately but eventually club mates Bunny Bennett and Jack Struggles suggested that the women and men train together. It was a close knit team and it wasn't long before the women were coming on in leaps and bounds. "The team trained three times per week with the Saturday being more of a social event. We would always go over to the pub afterwards or into the fish and chip shop. There were about 20 of us and the social side was really good back then. There were always house parties. It was real fun times." Early in 1951 the Birmingham club decided that some of the existing World Records were certainly within reach of some of their skaters. On 14th April, Kirkham's Birmingham team mate, Anne Humphreys, set a new World Record for the Ladies Half Mile with a time of 1 minute 39.6 seconds at the Embassy rink. Just minutes later Kirkham took to the track and beat Humphreys' time by 0.4 seconds. Kirkham suddenly found herself written into the history books as a 19 year old World Record holder. Just one year later her half mile record was beaten by another Brit, Maureen Stewart (Alexandra Palace) the reigning Half Mile British Champion. Again, the Birmingham club decided that some more World Records were up for grabs and so on July 20th 1952 the club set about trying to do just that. Amongst them was Kirkham, keen to regain her half mile record. This she did with some style. Team mate Pat Harris had already broken Stewart's record by some 1.2 seconds, but when Kirkham took to the track she smashed Eason's new record by almost 6 seconds! In a remarkable time of 1 minute 31.4 seconds Kirkham regained her half mile record. The time was deemed so remarkable that it is recorded the timekeepers and judges had to recheck their figures to make doubly sure it was correct. On the same day she also set two other World Records, the Quarter Mile (46.0 seconds) and the prestigious One Mile record (3 minutes 4.2 seconds), beating the previous time set just a few months earlier by almost 15 seconds! Kirkham was on fire. It would be another 7 years before anybody on the planet would officially go faster. On 22nd November 1952, aged 20, Kirkham took her first medal in a British Championship. It was a silver in the 1/4 Mile at the Alexandra Palace rink. Ahead of her was Joyce Robinson (Broadway), but Kirkham was now holding her own amongst Britain's elite, further proven when on 7th February 1953 at Granby Halls, Leicester, she took her second medal, a bronze, in the Half Mile Championship. 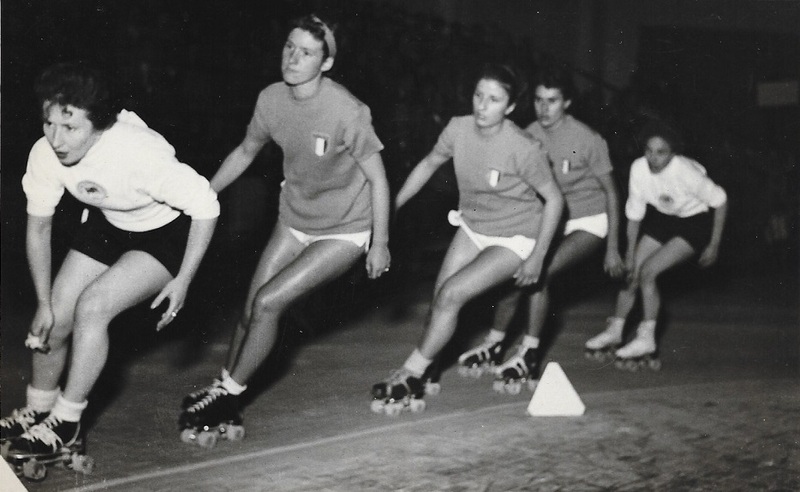 Around that time the National Skating Association (NSA) had been informed that the World governing body were to hold the very first women's World Championship between 19th and 20th September of that year at Venice-Lido, Italy. The circuit was to be on the road and so the Roller Speed Committee looked for a suitable road circuit with which to hold team trials for selection. For a few years after the war team selection and training often took place in the centre of war torn London at Moorgate. 1953 was no different. More than 60 years on, this is how Kirkham herself remembers it. "I had never skated on the road until this point. You had to be a certain standard to skate in the trials and I remember that you could still see the bombed out Moorgate underground station as we skated past it. We had wooden wheels and altered our plates to suit the road by extending the wheel base. Back then the plates were made by the men in the club and mine were mounted to some soft leather boxing boots. When the telegram came to say I had been selected I was ecstatic." 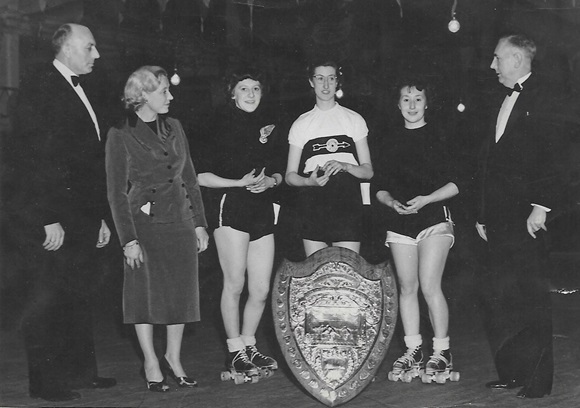 The first ever British women's team comprised of three skaters all from the Birmingham club, Marlene Worrall, Doreen Aspley and Kirkham herself. Travelling as a reserve would be another Birmingham girl and eventual world medallist, Pat Harris. It was a huge coup to be selected ahead of the London skaters. The team spent two days and two nights on a train travelling to the venue, arriving on the Friday and then racing on the Saturday and Sunday. "The circuit was almost on the beach and ran alongside the casino. I'd never been abroad before and I'd never seen anything like it. It was exciting to see the raised seats and the crowds of spectators. It wasn't until the opening parade that it suddenly hit home that here I was skating for Great Britain. The Team Managers, Mr. Lord and M. Lamb were very good, although Mr. Lord could be quite strict, sometimes I felt at the expense of the British team. He put a lot of emphasis on British etiquette and tried not to show bias, but I think he took it a little too far on occasion. Over the weekend we came to notice just how well the Italians worked. They were very well prepared and a very professional outfit. It was then we found out that the Italians had the backing form the government and had all their kit supplied to them." The support given to the Italians meant that the other countries were at a distinct disadvantage. 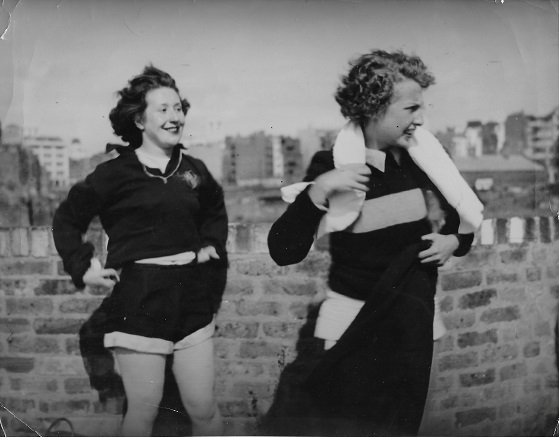 Indeed, in all three races the Italian women took the first three places, but Kirkham would come home as the best of the rest in 4th place in both the 500 metres knockout and the 10000 metres. In the 5000 metres she would finish 5th, just behind team mate Aspley. In one weekend Kirkham had shown herself to be a major player on the international scene and the biggest threat at that time to Italian dominance. On her return Kirkham was soon back in the thick of it with the Half Mile Championship being held at Granby Halls, Leicester on 14th November. Kirkham had made her way to the final and was one of the favourites to take the title. She led for most of the race and then on the last bend received a knock that took her wide and was just beaten across the line by Bradford skater, Pauline Hoyle. For Kirkham it was the "one that got away" firmly believing that the title had been well within her grasp. In 1954 the 1/4 Mile Championship was held at Bradford. Kirkham would not feature in the medals but a month later she would make up one quarter of the first ladies team to win the 2 Mile British Relay Championship for the Tufnell Bowl, a trophy donated to the NSA by Alan Tufnell, former Alexandra Palace skater and father of England cricket legend Phil Tufnell. As the year unfolded Kirkham was once again selected to represent Britain at a World Championships. She was the only one of the trio that had competed in Venice to get called up again, this time joined by 1953 reserve Pat Harris and Broadway's Joan Rawlings. It was back to Italy, where in October the event would be held in Bari. The team had no real details of the venue and did not even know that it was indoors until they arrived. The indoor track was tiled with small gaps in between each tile. The surface of the rink caused Kirkham's feet to become badly blistered, not helped by the fact that she had been born with a slightly crippled foot. Despite this she still managed to finish with two 5th places and a 6th place on what was a very technical track. In fact she had led for most of the way in the event, the 10000 metres, that Joan Rawlings took bronze in to become the first non-Italian women to win a World Championship medal, however, Kirkham could not have known that her last race here would be the last time she would pull on a British shirt. In February and March 1955 Kirkham once again took medals in both the 1/4 Mile and Half Mile Championships, both at Bradford. In both cases the vents were won by local girl Gardiner with Pat Harris (Birmingham) 2nd and Kirkham 3rd. Harris was by now coming of age and although team mates was now Kirkham's biggest rival on the track. Off the track the pair were firm friends. On 3rd December 1955 (the 1956 season) Kirkham made the final of the Half Mile Championship on her home track, the Birmingham Embassy. Unfortunately for Kirkham the event had probably arrived in Birmingham just a year too late for her to take the title. Kirkham would again finish second, this time behind team mate Harris. By now Pat Harris was eclipsing Kirkham in races and this victory would be her first title of many that she would go on to win over the next decade. There were no major international events in 1955 but 1956 was to see the World Championships move to Barcelona, Spain. Kirkham's only domestic medal that season came in February 1956 when she once again helped the Birmingham women retain their British Relay title on their home track. As the season unfolded and the team trials took place it soon became apparent that the only woman skater to be selected for Barcelona was going to be Pat Harris. Kirkham had been on the very first team sheet in 1953 and again in 1954, but with her form dipping and much to her disappointment she was not considered for Barcelona. "Only three skaters were invited to the trials. This time there was no telegram. I was told on the day that my times were not good enough to go and that Pat (Harris) would be the only one selected. I had lost a bit of speed by then - probably because I hadn't trained hard enough, but I was still very disappointed not to get selected. Skating was more than a hobby to me, it was a love." On 23rd February 1957 the Birmingham ladies whitewashed the medals in the Half Mile Championship on their home track. Harris won ahead of Kirkham with Doreen Campbell (nee Aspley) 3rd. It was Kirkham's last individual Championship medal and by now she was starting to fill her life with other things. The World Championships were held in Palermo, Sicily, that year but Britain elected not to send a team, citing the lack of suitable training facilities as the reason behind their decision. Another decision that affected how Kirkham was now viewing the sport. On 16th November 1957 Kirkham took her last Championship medal. Again it was gold in the 2 Mile Relay making it a hat-trick of victories for Kirkham and the Birmingham team in this event. Shortly after Pat Kirkham hung up her boots for good. In 1958 she married her long time fiance and fellow skater, Barrie Brown, and looked for other interests in her life. Marriage was not the only reason she quit the sport, Kirkham being the competitor she was wanted to "go out on a high" and felt it was the right time for her. After all, she was still a triple World Record holder. For a while she went to see a couple of races but her life style had changed and she began to find it increasingly difficult to attend. She did not go into judging for the same reasons. With the loss of skating from her life, though, she still needed something that she and Barrie could do together and so the couple took to archery. Forever the competitor she did this for a number of years, again winning medals in competitions. Catching up with Pat Kirkham it is evident that the 8 years she spent in the sport of roller speed skating has stuck with her for over 60 years. It is interesting to note that when presented with an opportunity a couple of years back to try out some inlines, she didn't shy away but gave them a go. By her own admission she was "a bit wobbly" but the fact she tried them at all aged 80 something is testament to her character. In fact she now frequents the Birmingham Wheels track on race days with Barrie and has been known to present the occasional medal and trophy as a VIP guest. Pat Kirkham is one of life's nice people. If there is one thing that niggles her it is the fact that she didn't win a British Championship. She firmly believes that the race at Leicester in 1954 was "hers" but circumstances took that away from her. If you talk to her she will tell you that she was once told she didn't have the "killer instinct". Personally, I don't think you need to have that to be classed as successful. In fact, in 1953 no one in the world could stop the Italians sweeping all before them, but Pat Kirkham came very close. In fact closer than anybody. 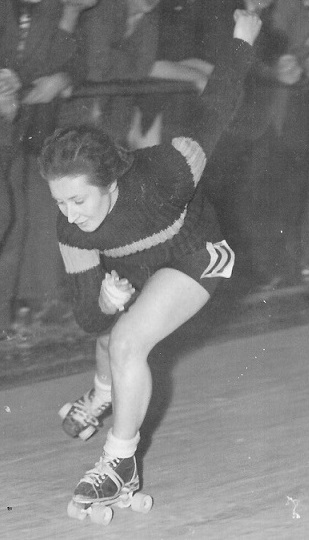 Pat Kirkham may not have been a British Champion but she broke no fewer than four World Records, took no fewer than seven medals (at least one every year) in individual British Championships between 1953 and 1957 and pioneered the way for numerous women skaters to take part in World Championships. British Champion or not, Pat Kirkham will always be a British Skating Legend.